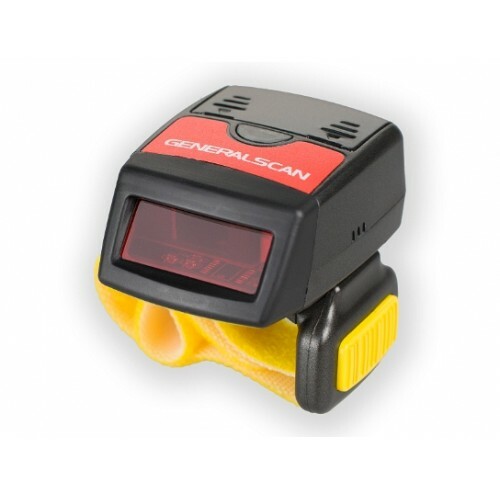 GS-R1000BT wireless function allowing unparalleled freedom for movement in scanning, it can be avoid drop down and damage scanner when you wearing on the finger. Super Class2 bluetooth technology and long range 2.4G antenna make you transfer data with 20M distance .You never need add more headcount to finish more work equip with GS-R1000BT wearable ring-style scanner. At the same time, we provide RS232 and USB version to connect PC and Electronic label shelf. GS-R1000BT can connect with iOS and android smart phone easily .Special design bluetooth protocol, you can scan barcode into iPad and iPhone directly without install any software ,double push trigger button ,you can display and hide soft keyboard in iOS . GS-R1000BT bluetooth scanner can work with GS-D100BT Dongle, You can scan barcode in the distance of 50 meter with USB port or RS232 port in PC. You do not need install any driver in the PC ,save your maintenance cost and decrease the complexity of usage .You can also fix the GS-D100BT in anywhere by using bracket and rubber plate we provided .